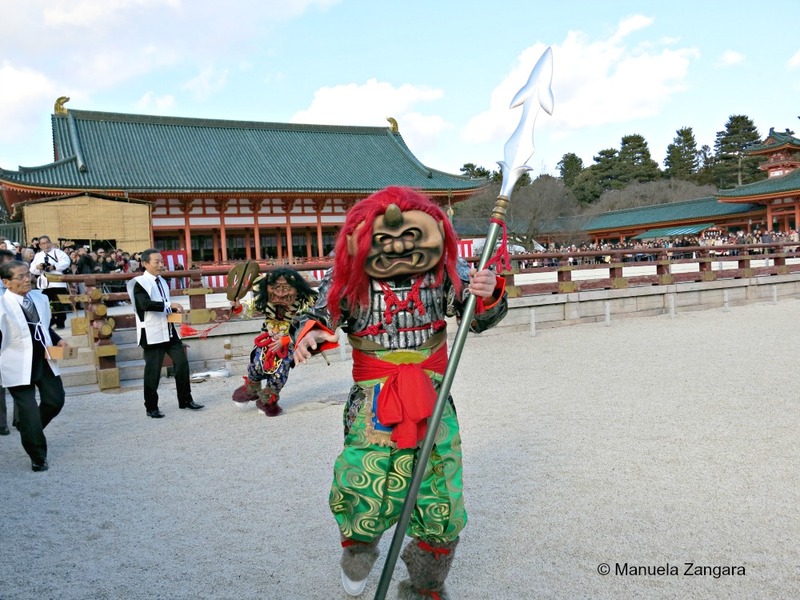 Setsubun (which literally means “seasonal division”) is a festival held every year on the 3rd or 4th of February, one day before the beginning of spring according to the Japanese lunar calendar. 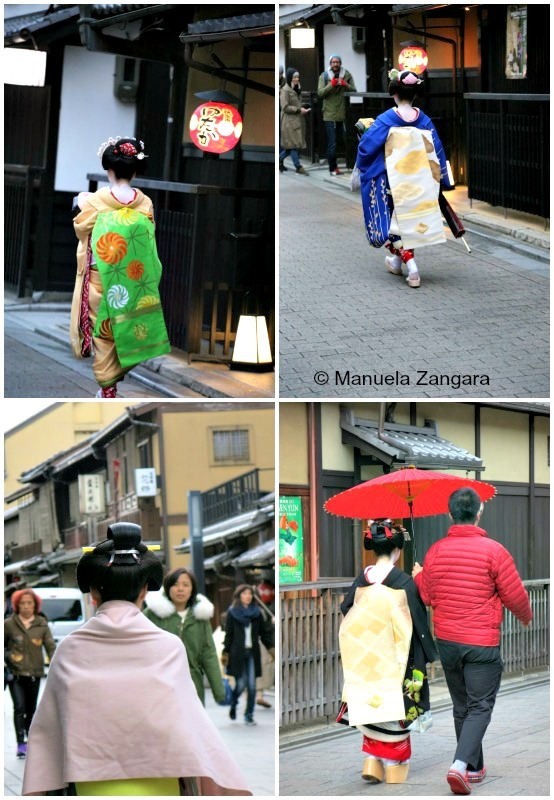 We were lucky enough to be in Kyoto at that time, so we managed to see some of the celebrations! 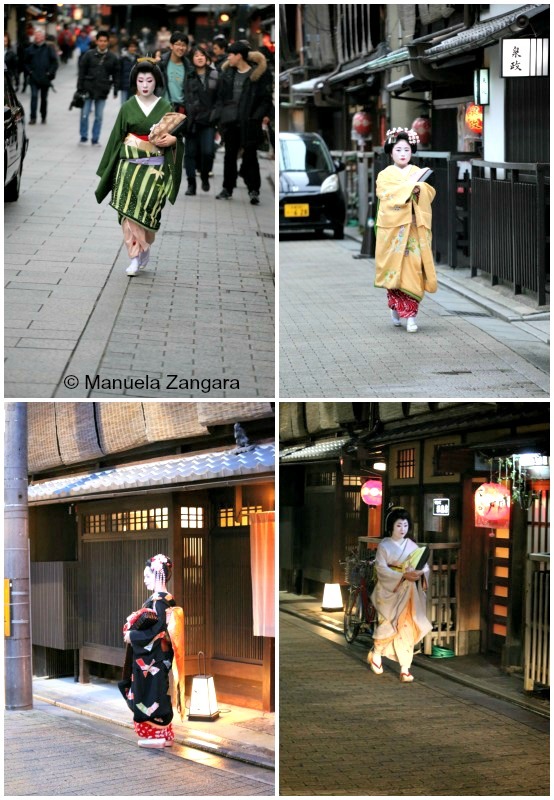 For many centuries, Japanese people have been performing rituals to chase away evil spirits at the start of spring. 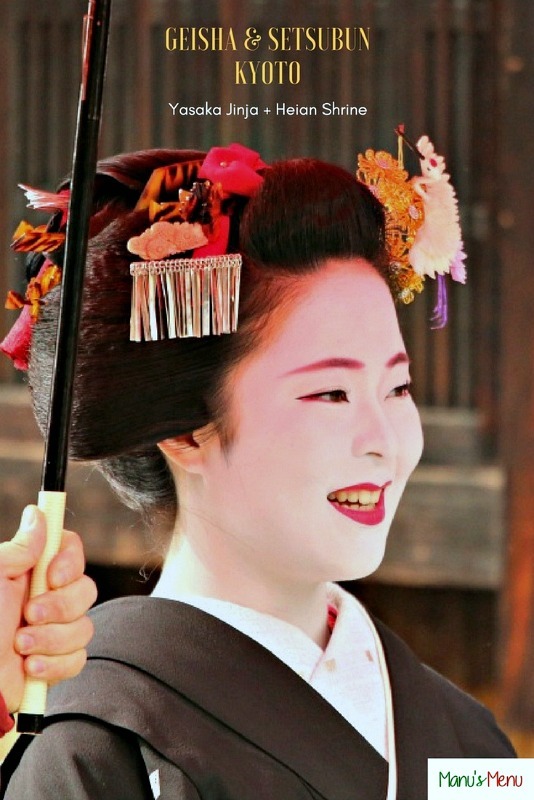 Around the 13th century, for example, it became a custom to drive away evil spirits by the strong smell of burning dried sardine heads, the smoke of burning wood and the noise of drums. 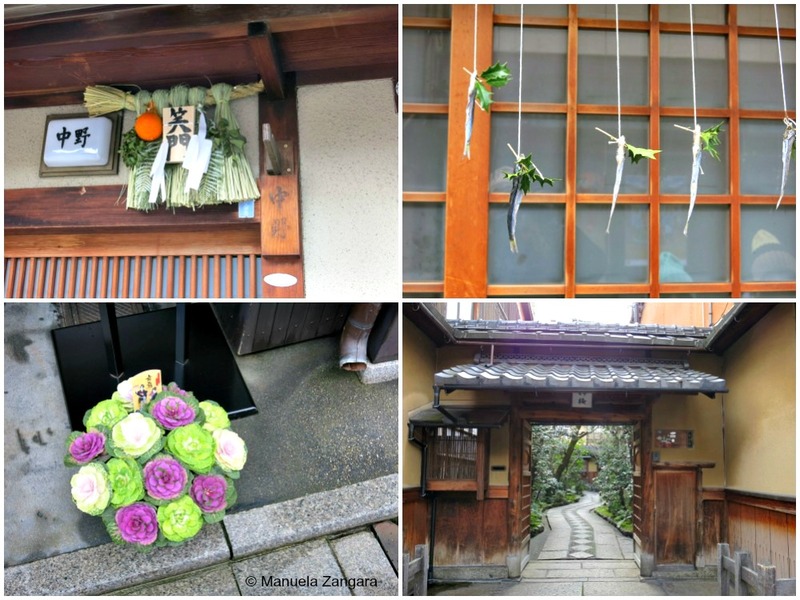 While this custom is not popular anymore, a few people still decorate their house entrances with fish heads and holy tree leaves in order to deter evil spirits from entering. 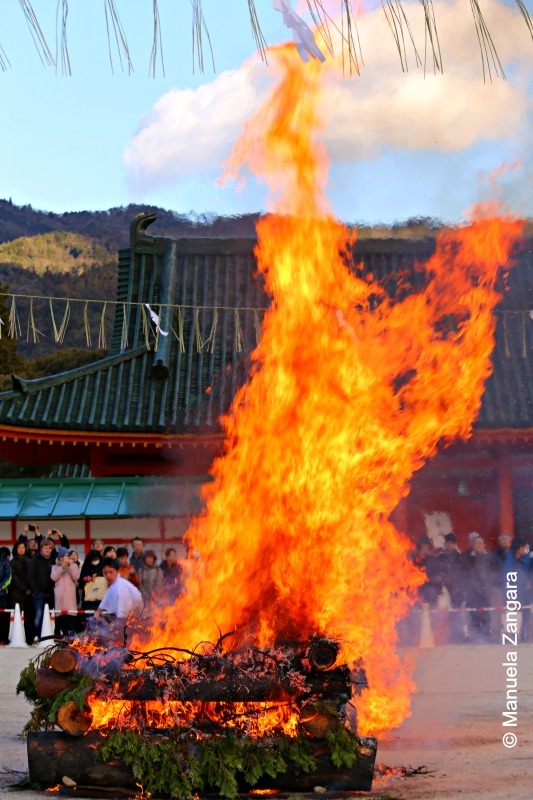 Nowadays, the most commonly performed setsubun ritual is the throwing of roasted beans around one’s house and at temples and shrines across the country. 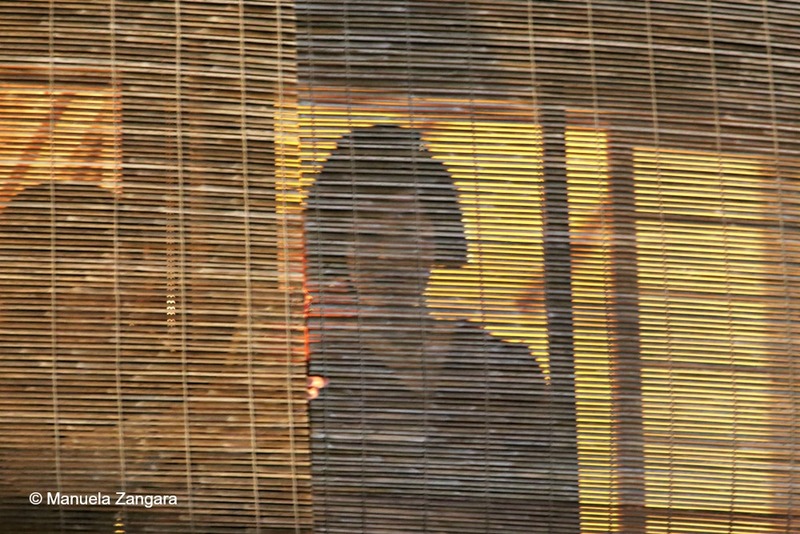 When throwing the beans, you are supposed to shout “Oni wa soto! 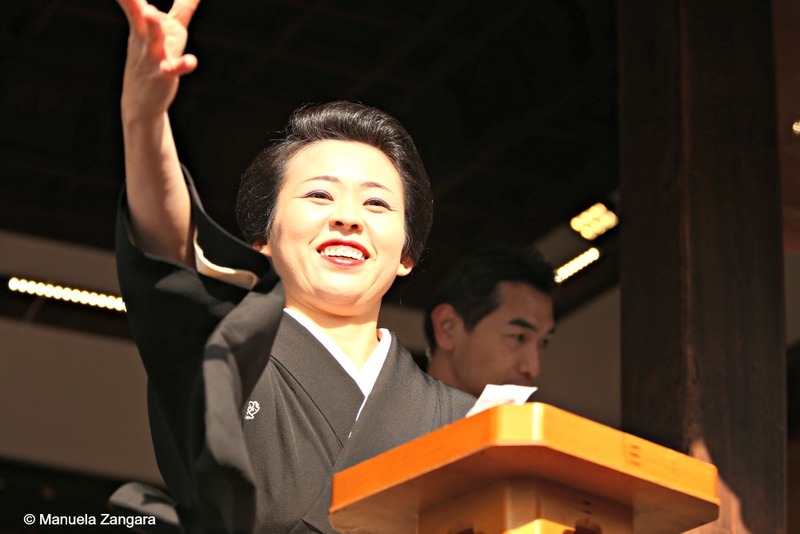 Fuku wa uchi!” (“Devils out, happiness in”). 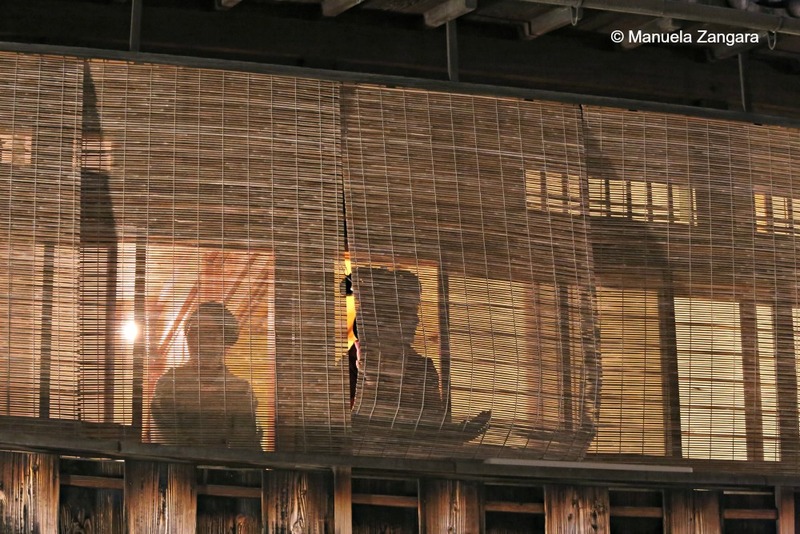 Afterwards, you should pick up and eat the number of beans, which corresponds to your age. 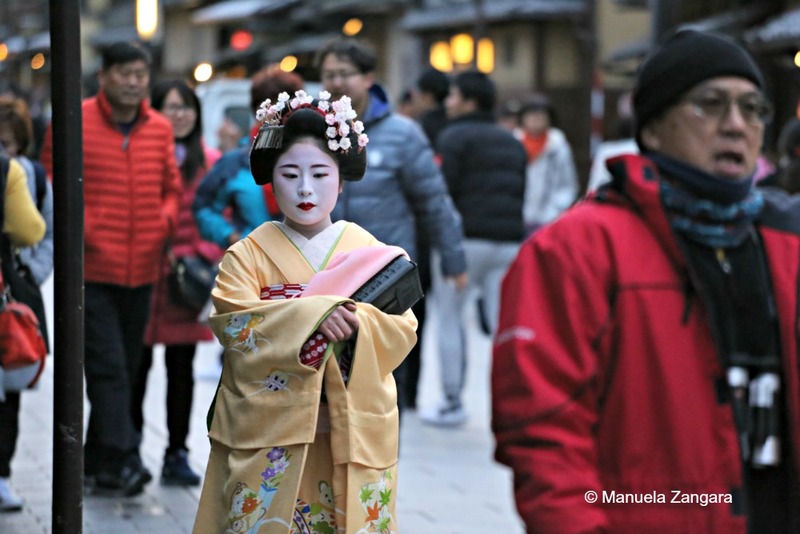 As all traditional festivals, setsubun is celebrated in many variations throughout the country and we were lucky enough to be in Kyoto at the right time. 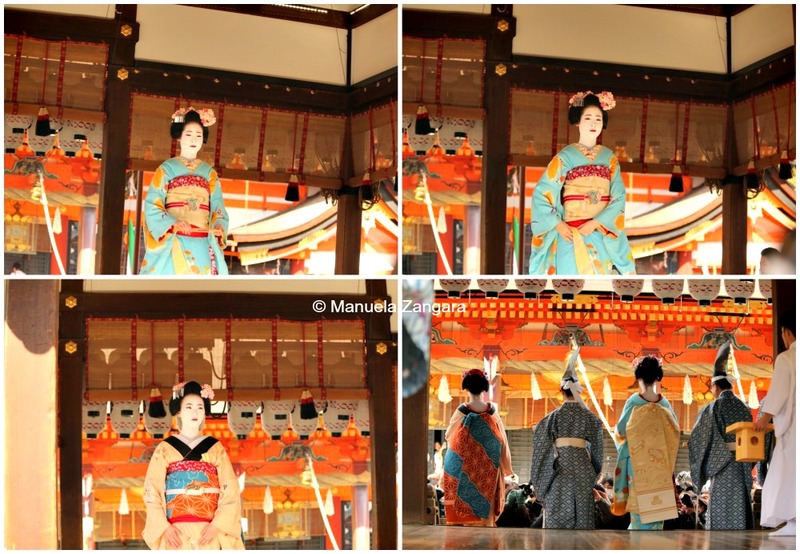 We attended 2 ceremonies, one at Yasaka Jinja and the other one at Heian Shrine. 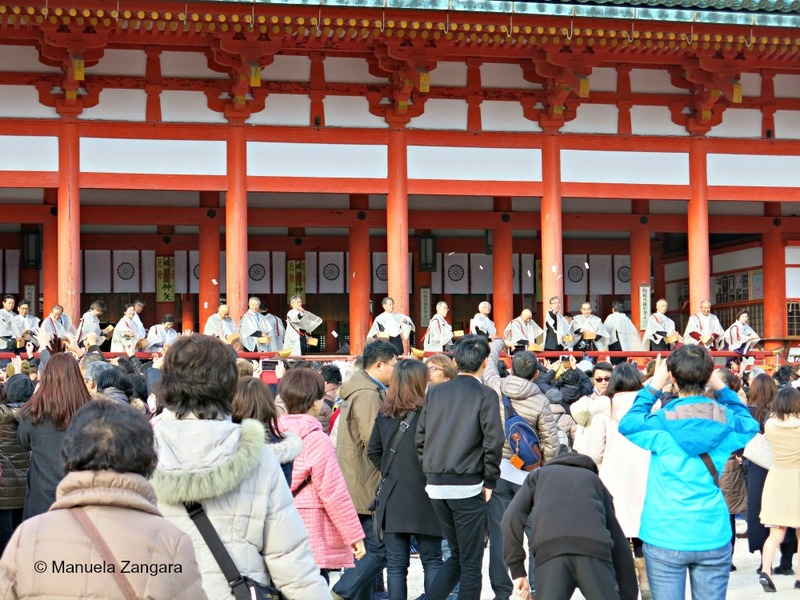 Each Kyoto shrine has its own attraction for the Setsubun ritual. 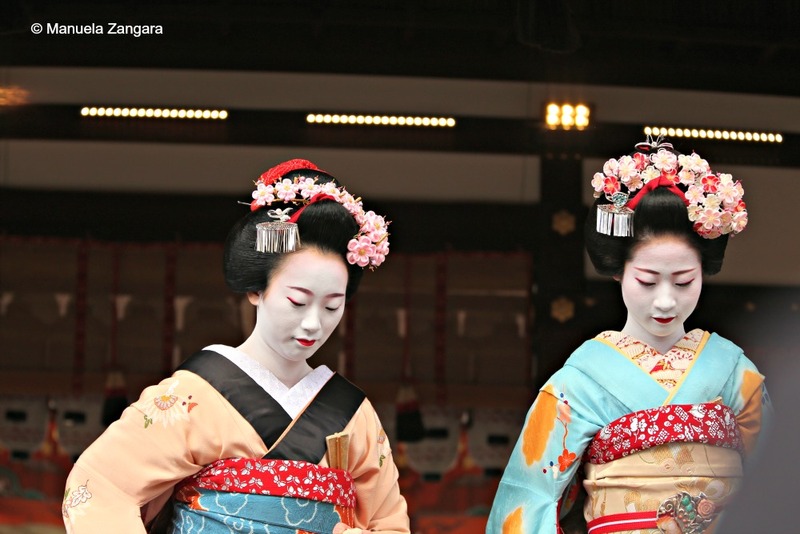 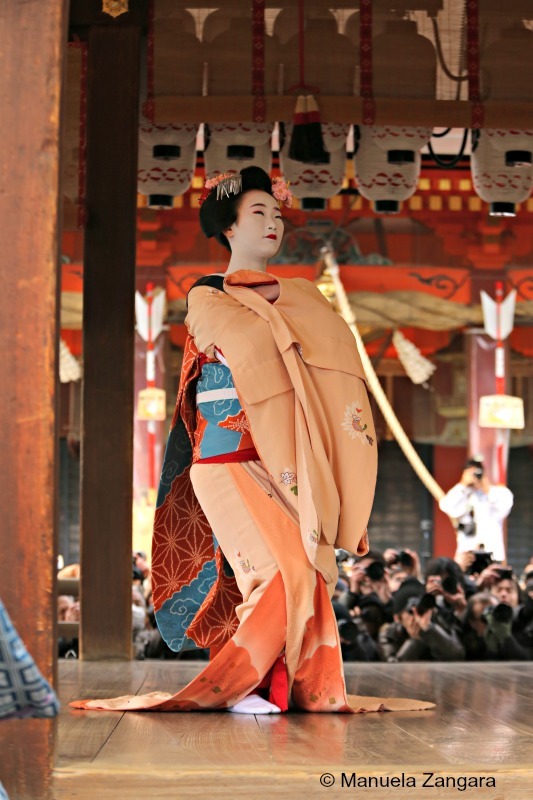 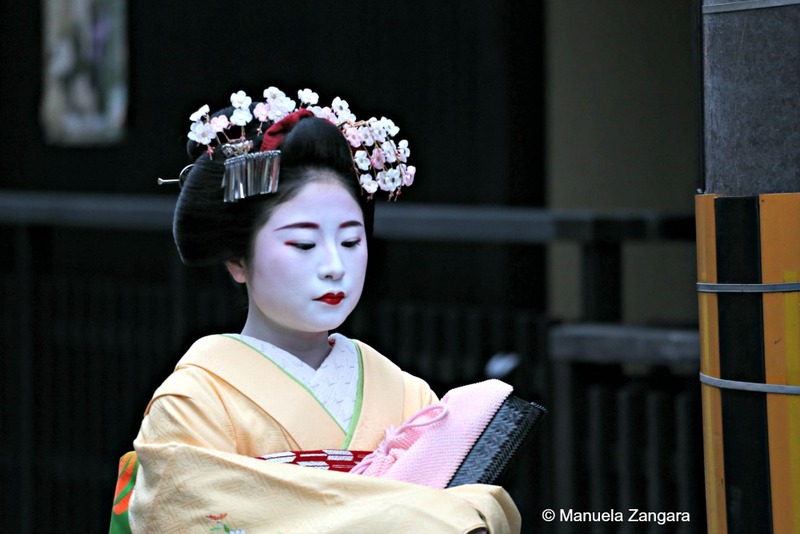 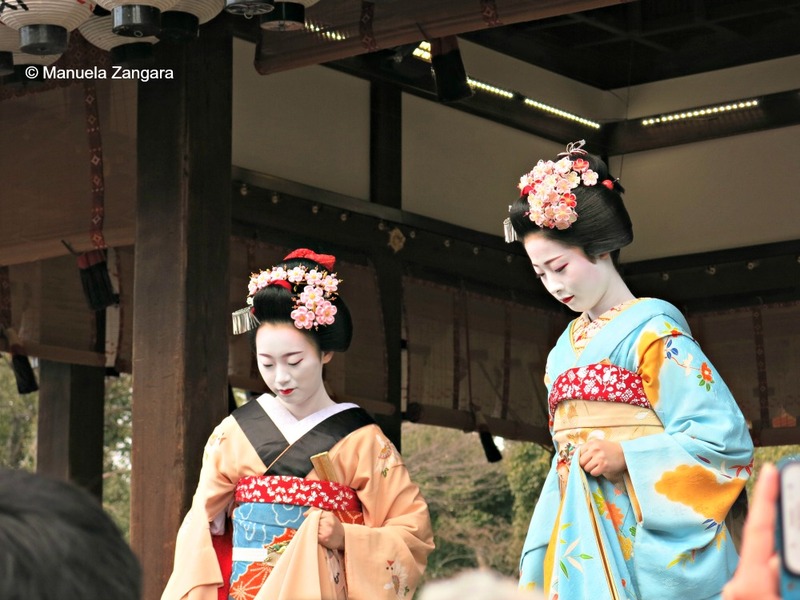 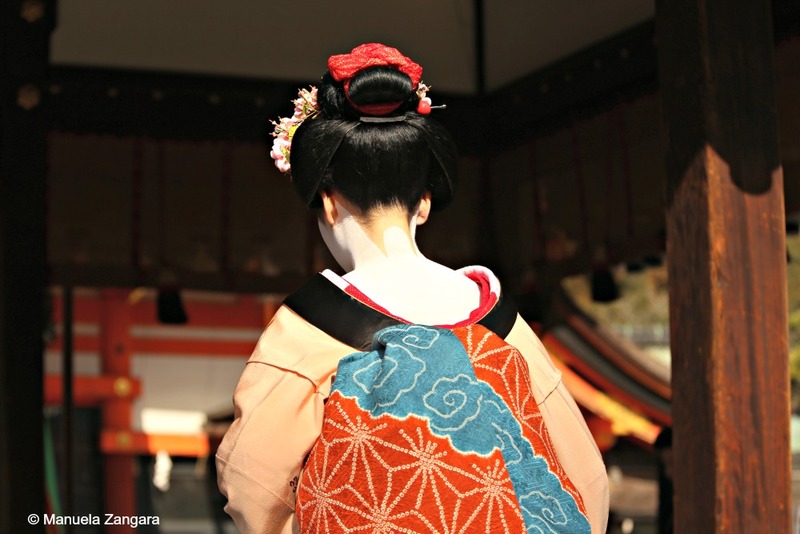 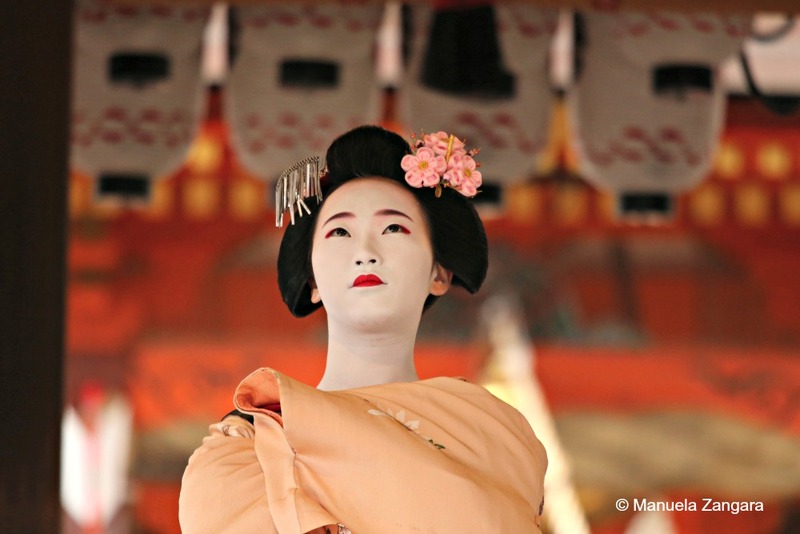 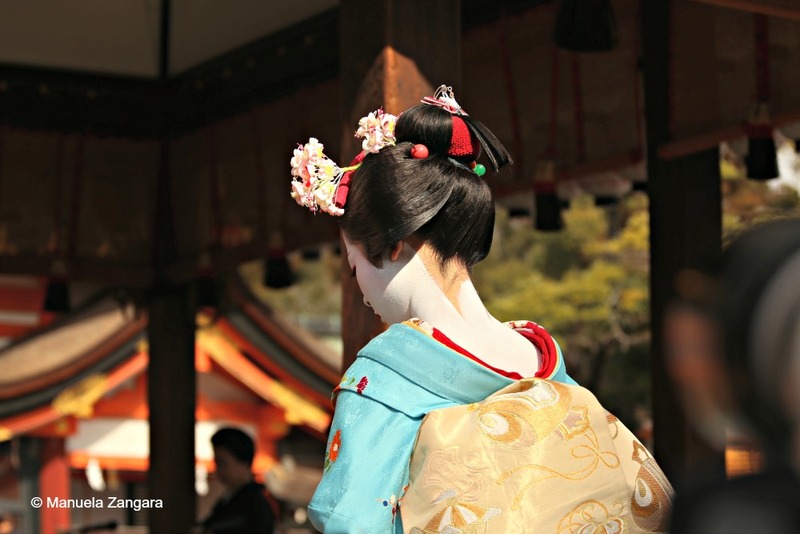 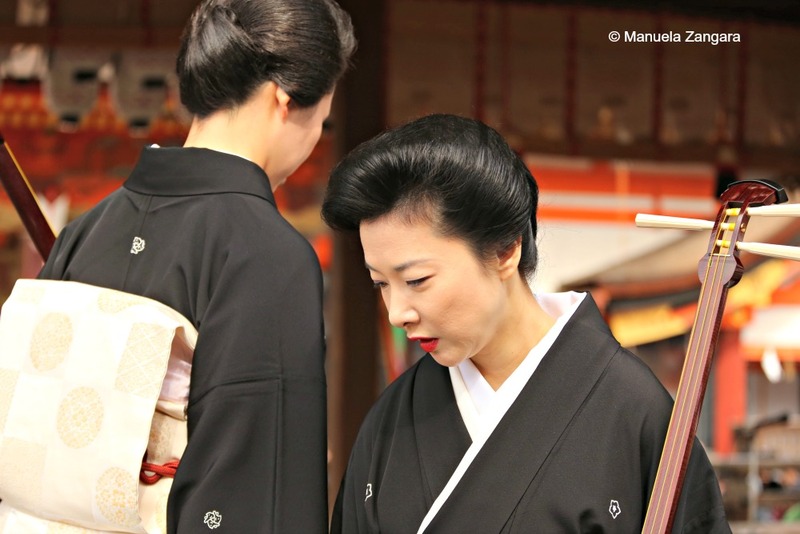 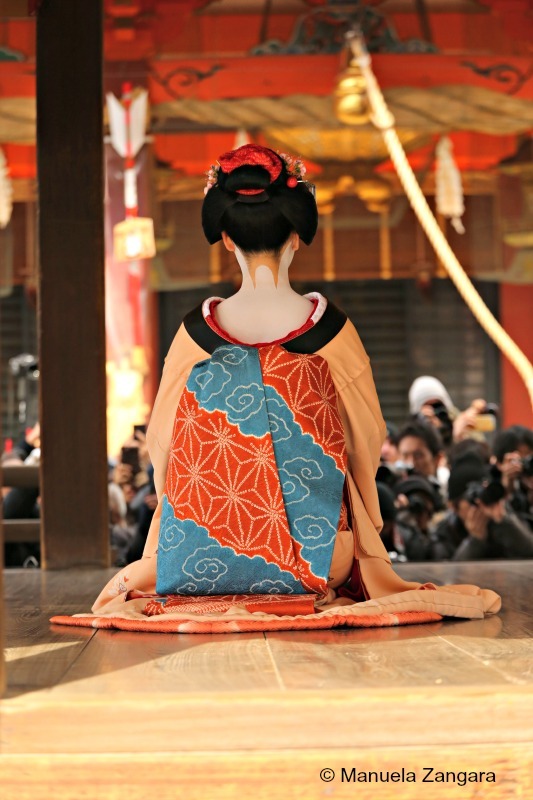 Yasaka Jinja offers dances by maiko (apprentice geisha) for the enjoyment of the gods. 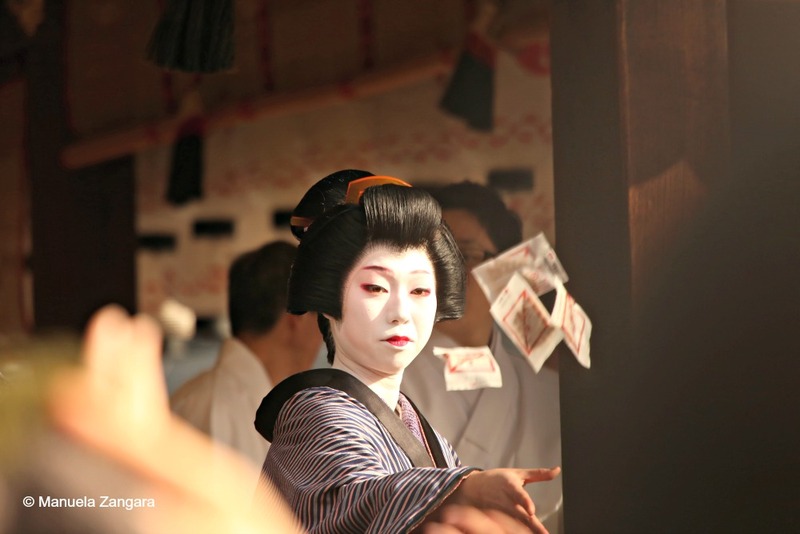 The courtyard at Yasaka Jinja was absolutely packed with people, mostly locals, who came to see maiko from four geisha districts of Kyoto dance and throw beans. 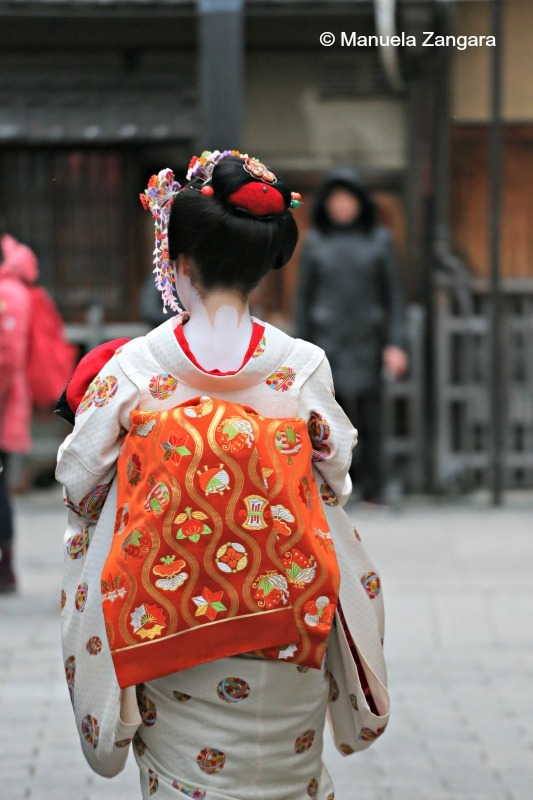 You can also buy lucky beans that come with a lottery ticket, get a paper amulet on a stick that keeps the evil at bay for a year, and eat zenzai red bean soup that wards off evil. 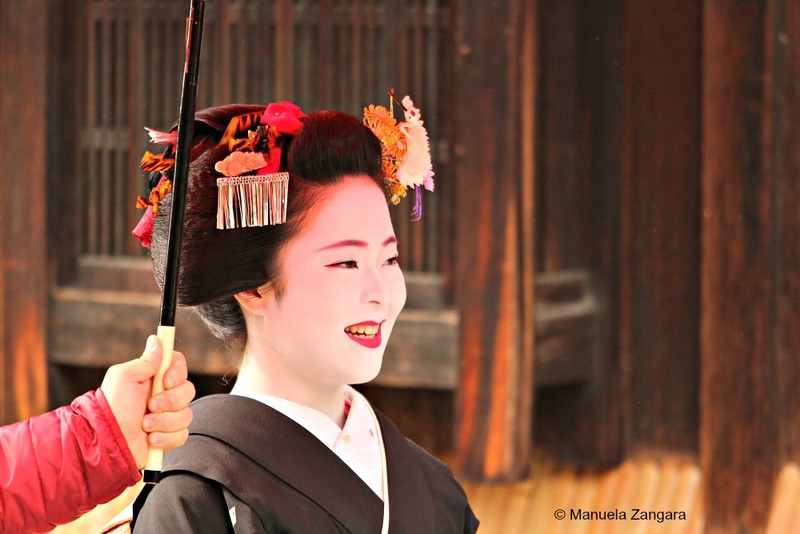 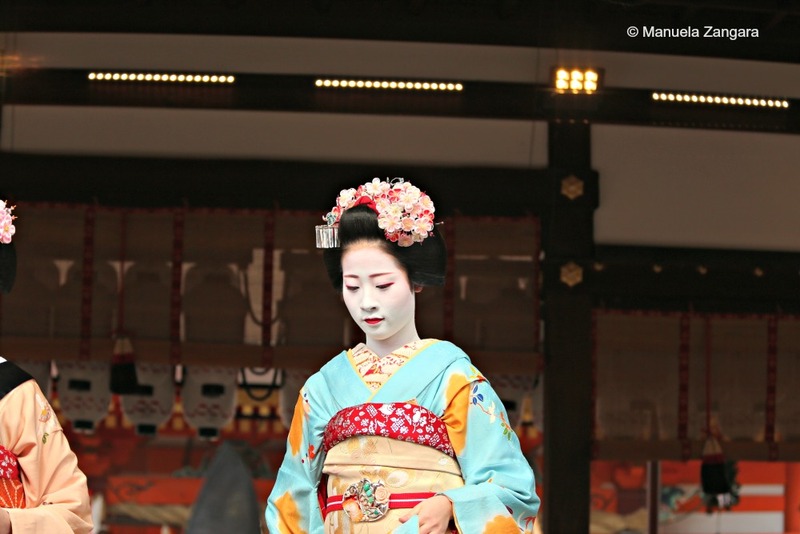 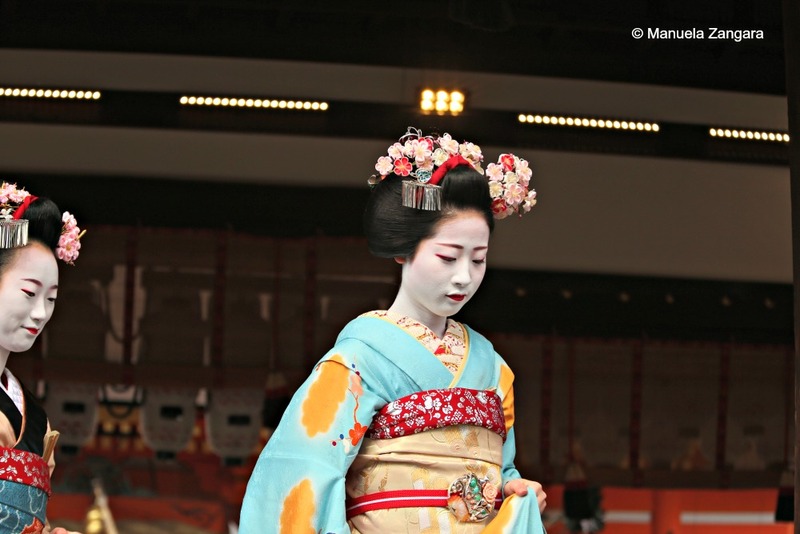 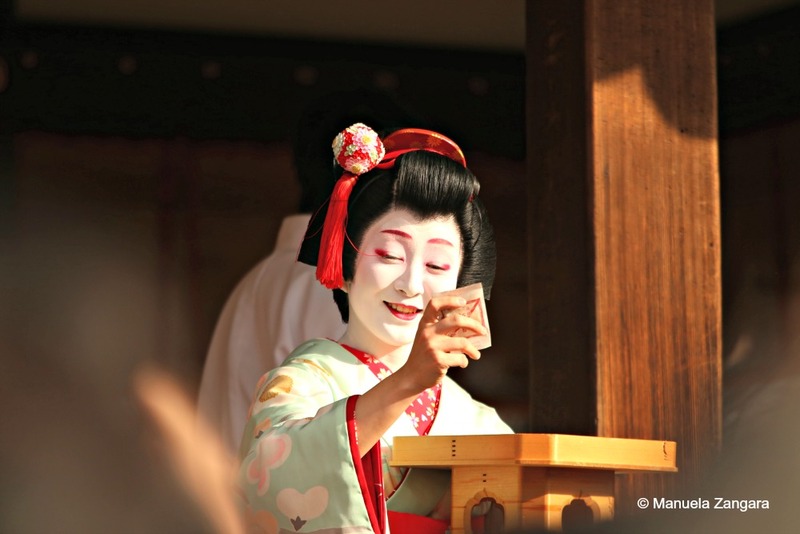 The graceful dance and bean throwing by the maiko is absolutely worth a visit! 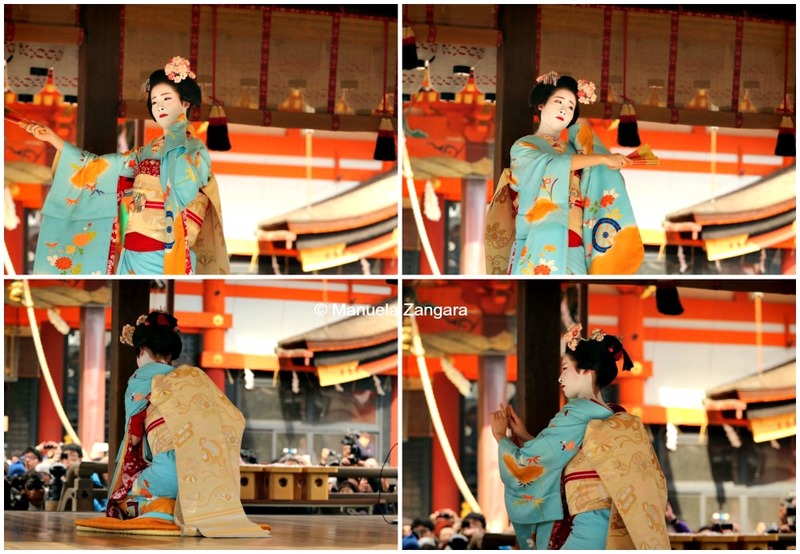 It’s not every day you can enjoy geisha dancing! 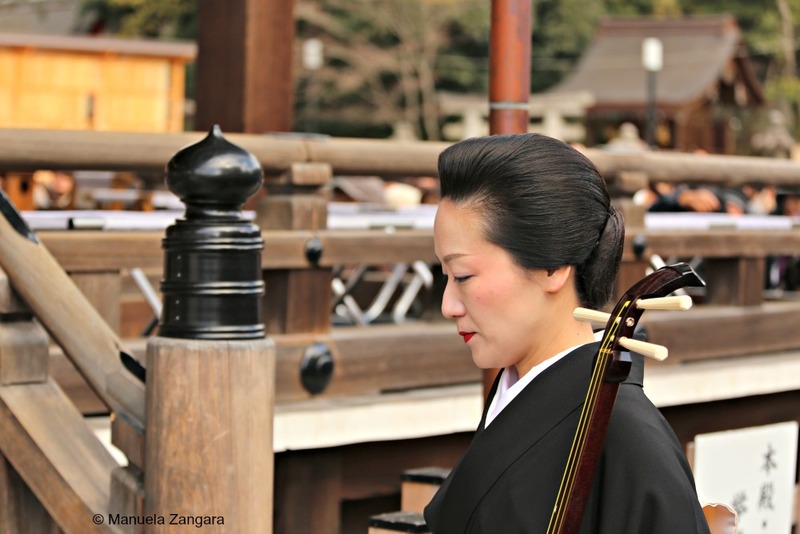 The live music was also beautiful. 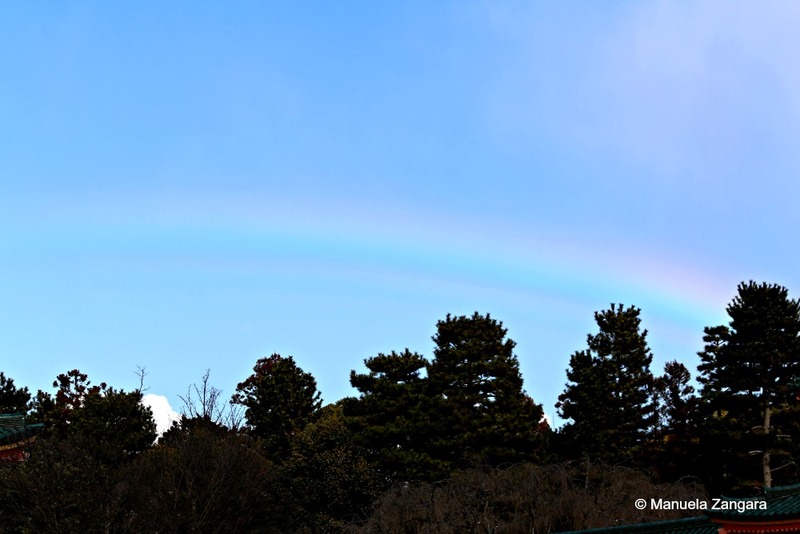 Here is a video we managed to take. 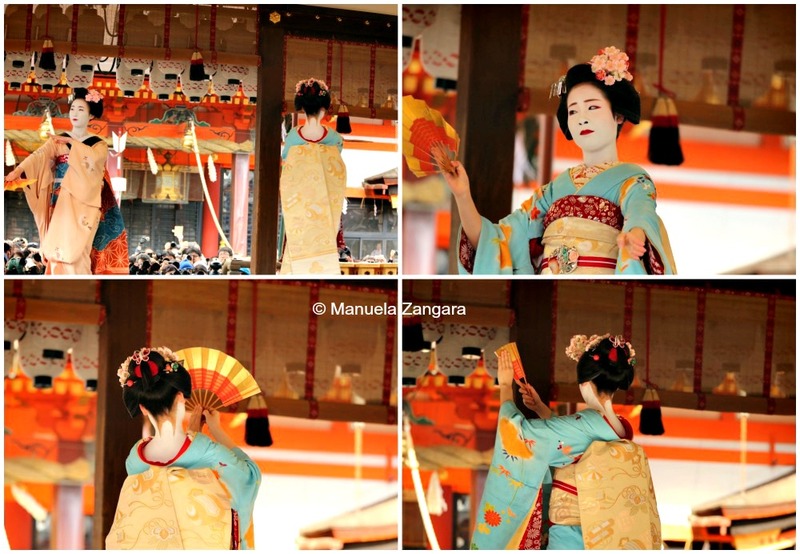 At the end of the performance, the geisha/maiko/musicians threw lucky beans to the audience. 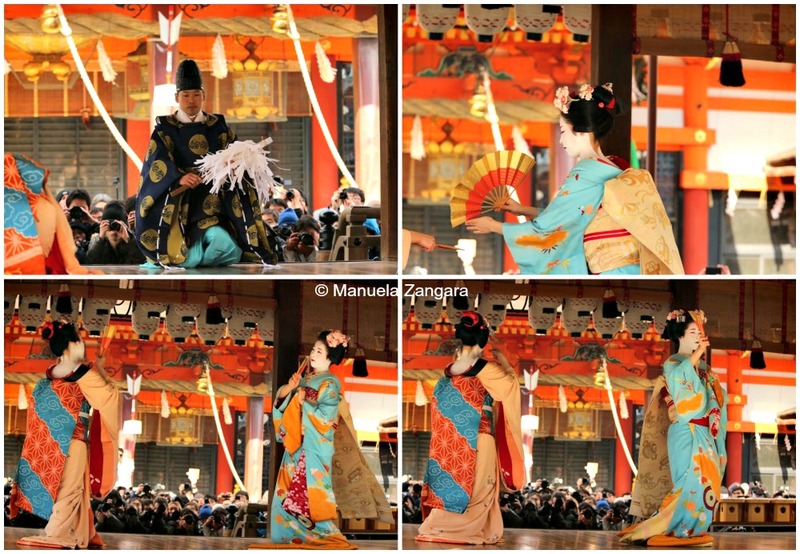 The second event we attended was at Heian Shrine. 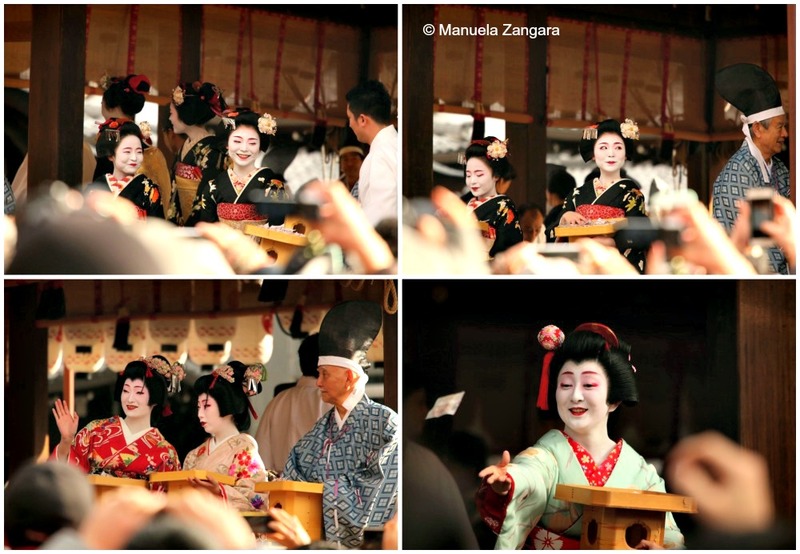 This was a completely different kind of event. 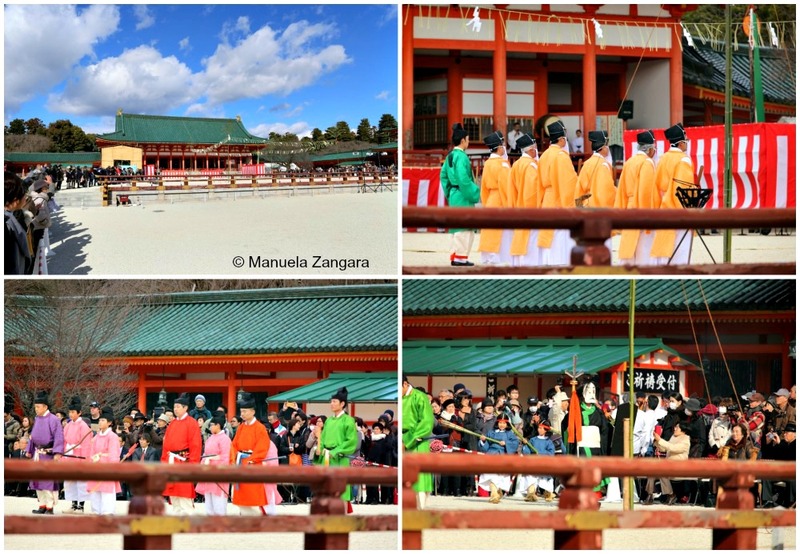 The festival begins in the inner sanctum, where priests perform rites. 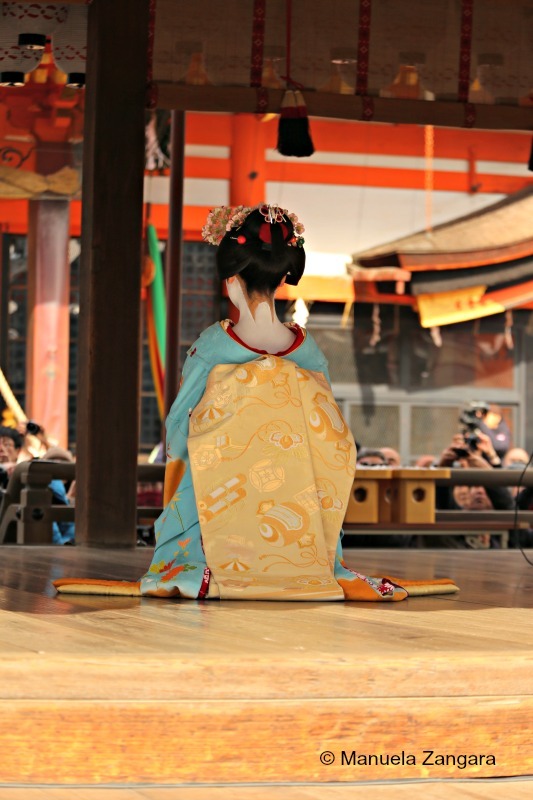 A recreation of the Heian period Daina no Gi ritual is held in the courtyard. 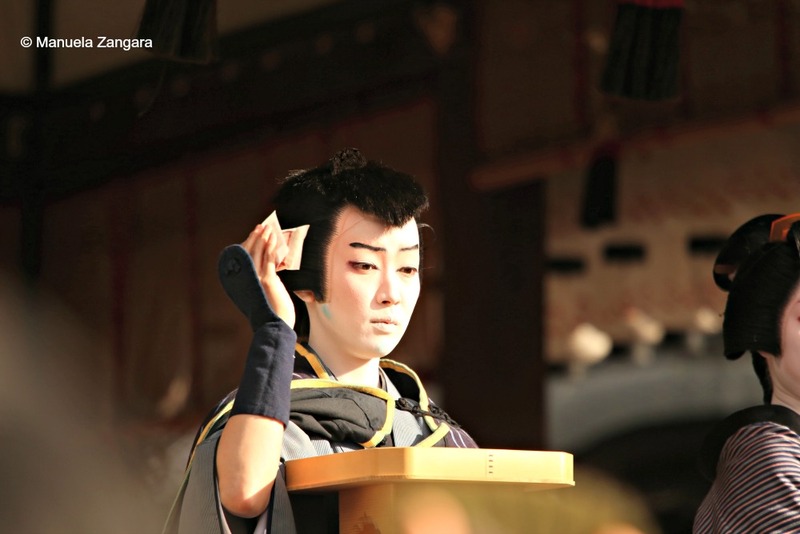 This ritual was held at the Imperial Palace to cleanse misfortune. 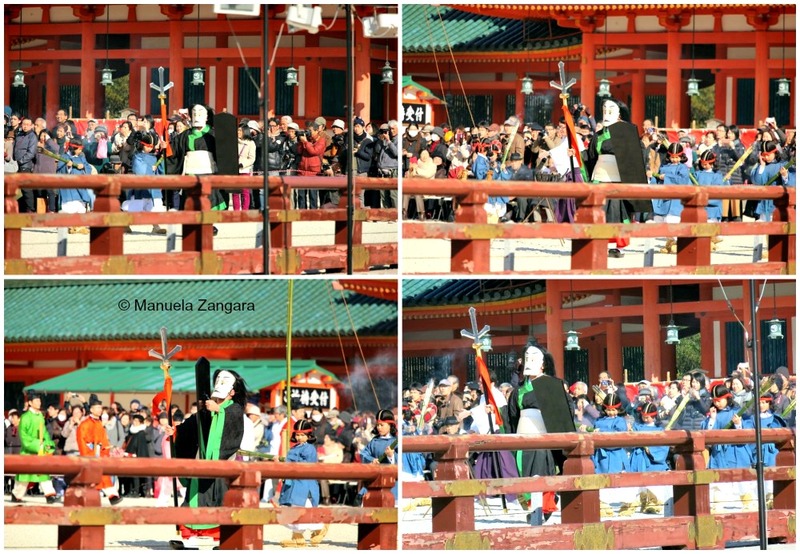 The ritual begins with an invocation before the altars. 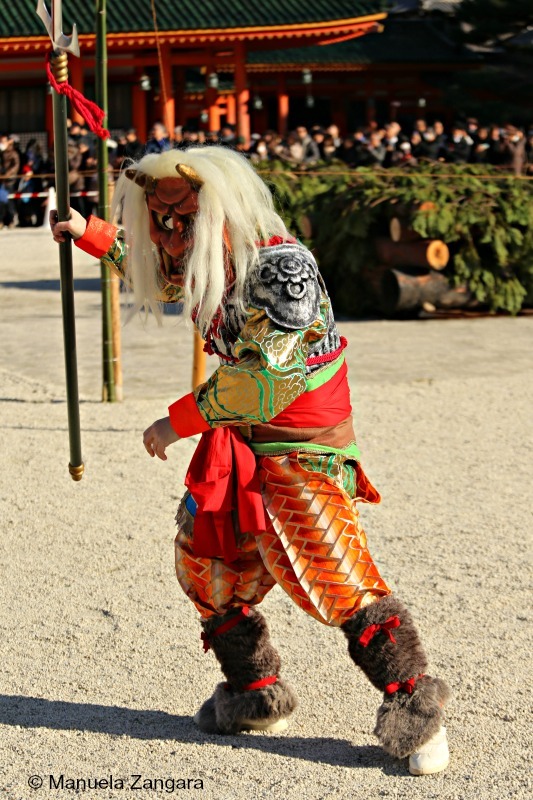 A warrior fires arrows in the cardinal directions to erect a sacred barrier. 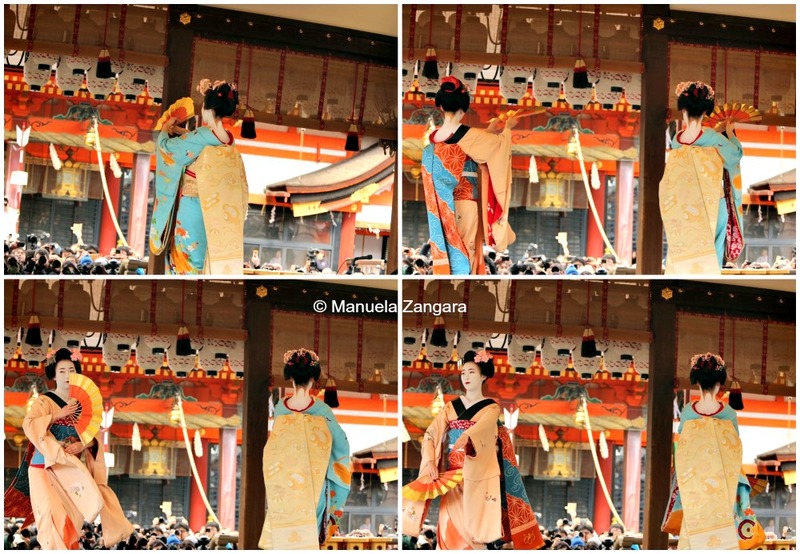 Another warrior symbolically cuts bad ties with a “sword”. 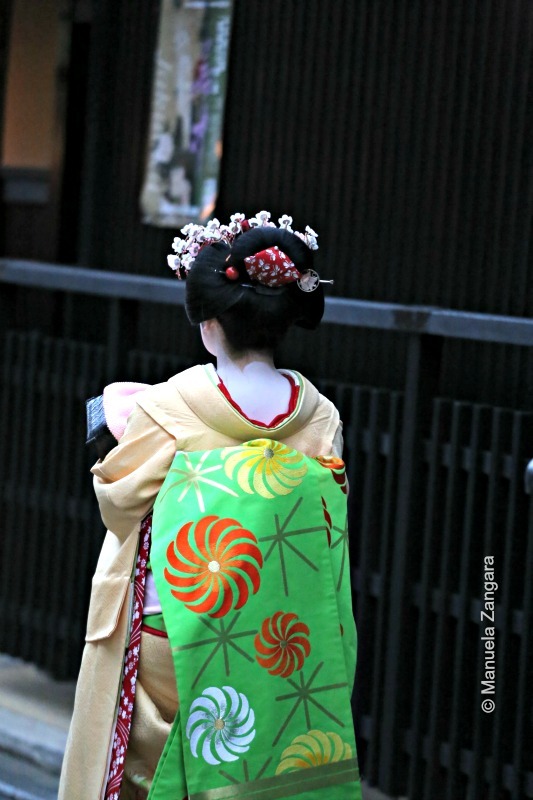 The demon queller leads a procession around the courtyard accompanied by children. 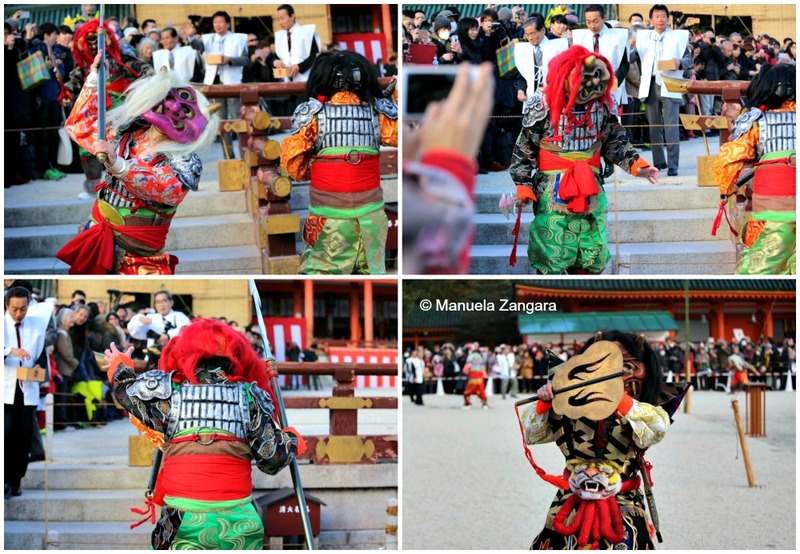 Oni (demons/ogres) represent the misfortune people are trying to cleanse. 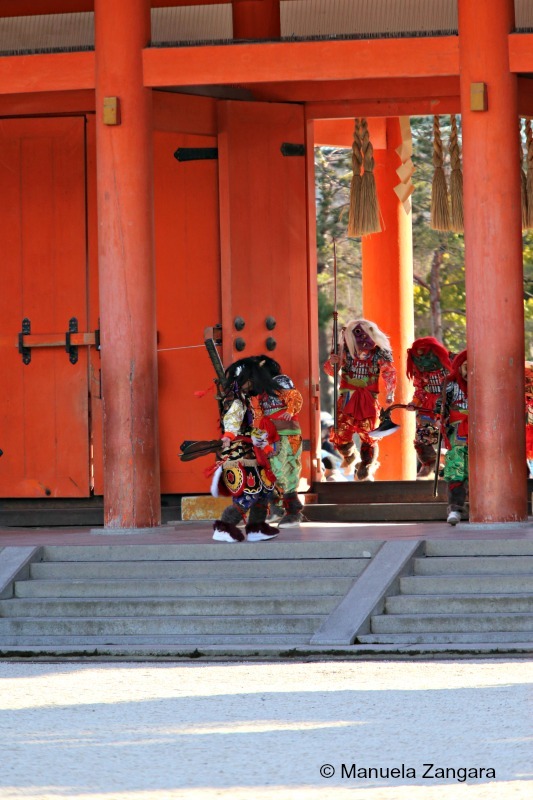 A group of oni appear to make an assault on the shrine. 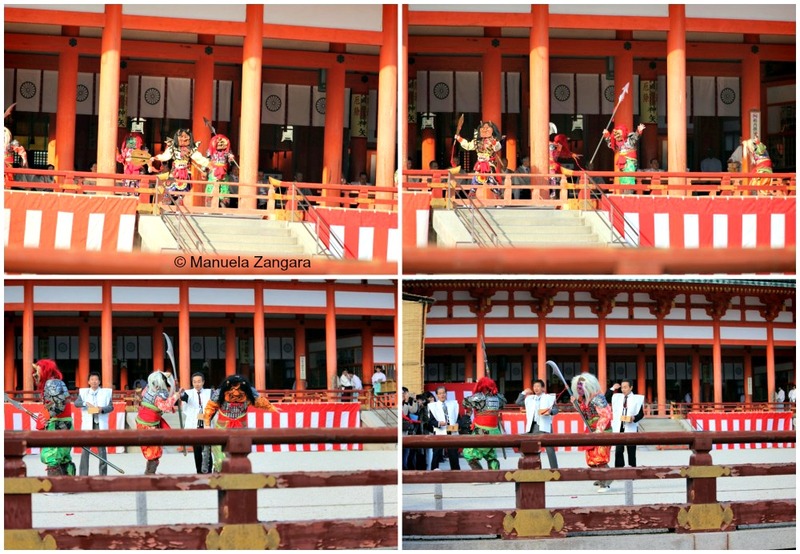 On the stage, the oni perform the Oni no Mai dance. 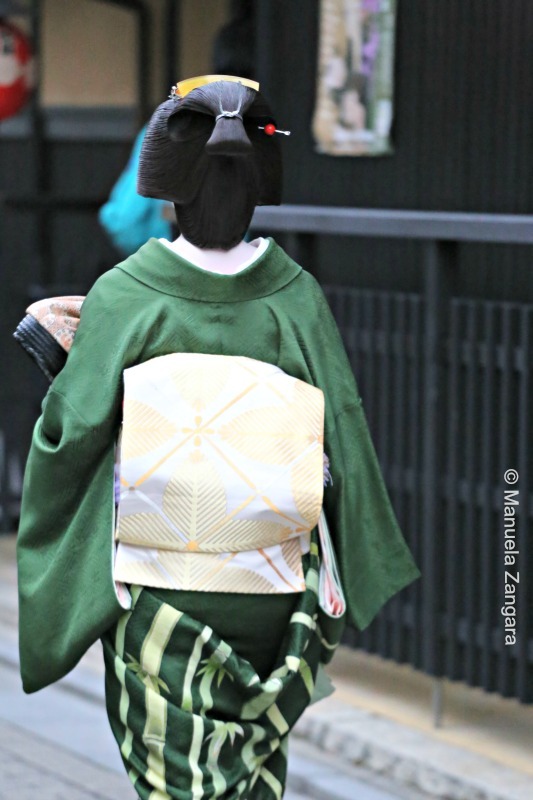 Shrine parishioners throw roasted soybeans to chase the oni out when these get close to scare them. 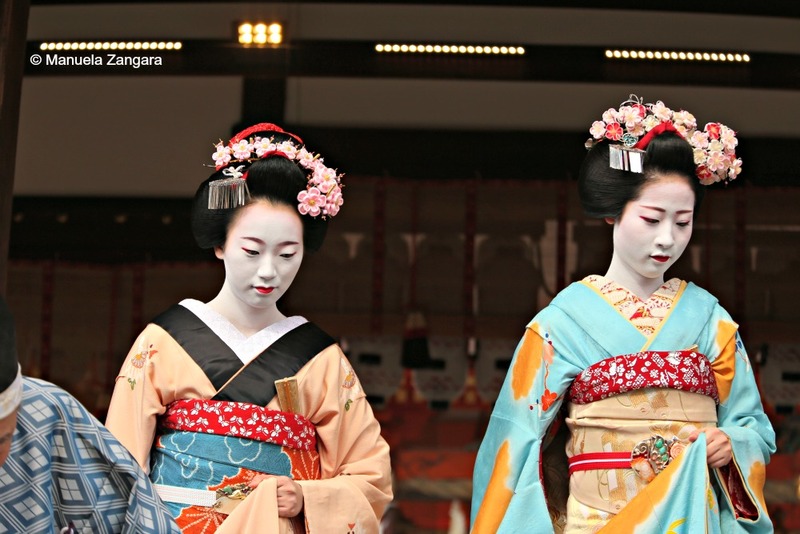 They chant “oni wa soto, fuku wa uchi” (“bad luck out, good luck in”). 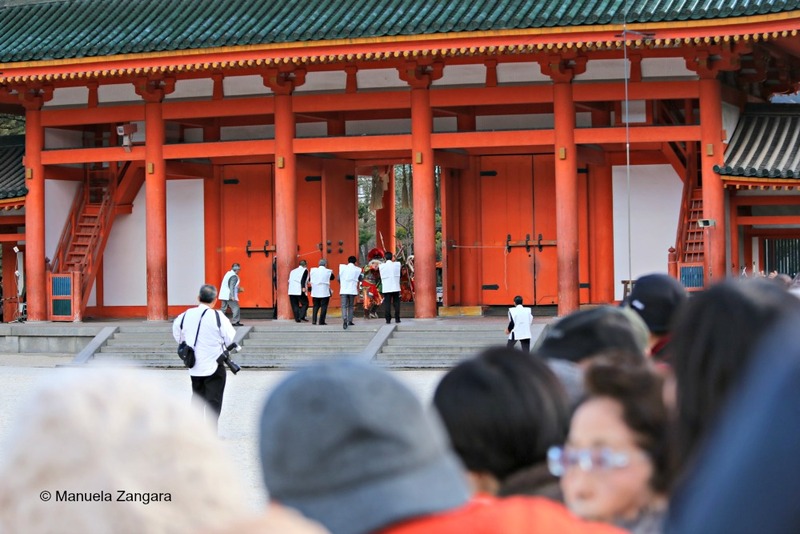 After the oni get sent away, people gather in the hopes of catching a pack of lucky beans. 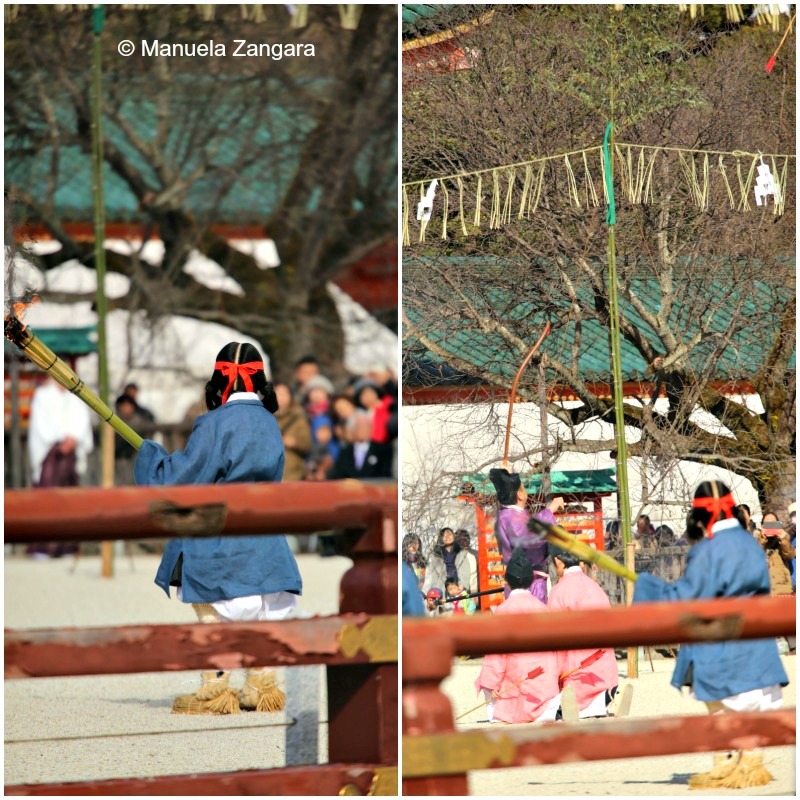 Some people eat the beans or use them at home to celebrate Setsubun. 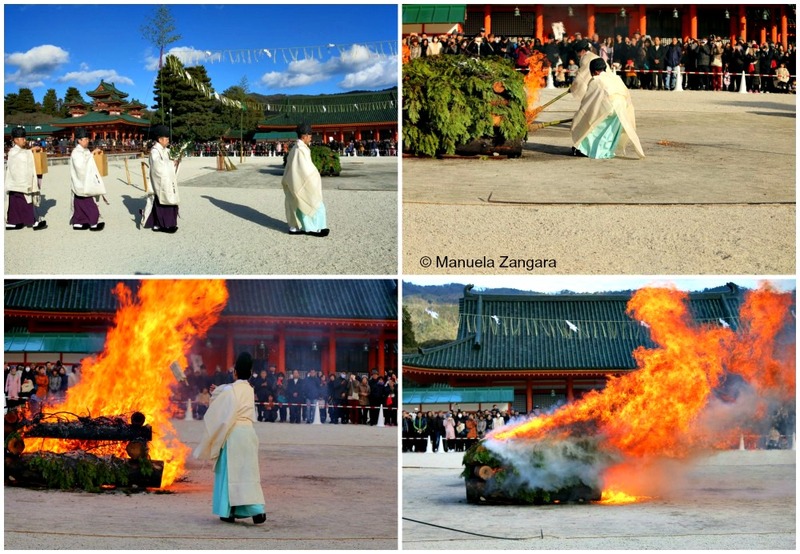 The last part of the ceremony is an ohitaki shinji fire ritual. 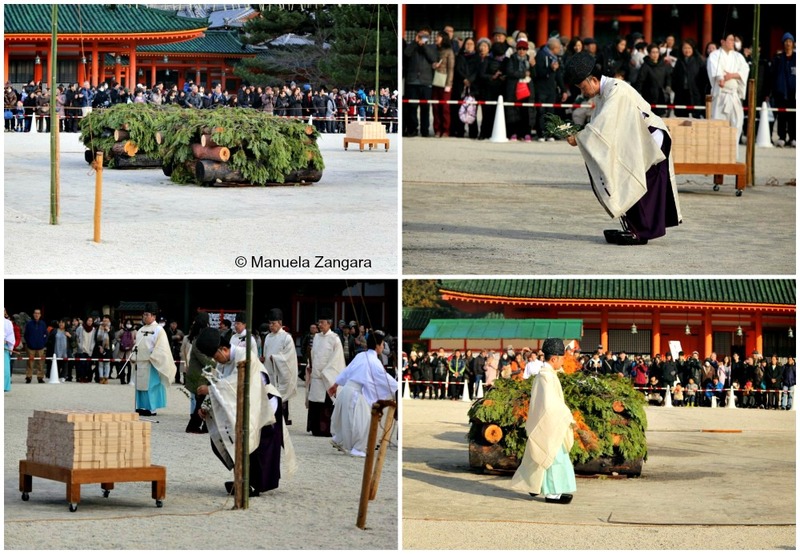 Priests toss hitakigushi (sticks with prayers written on them) into the fire. 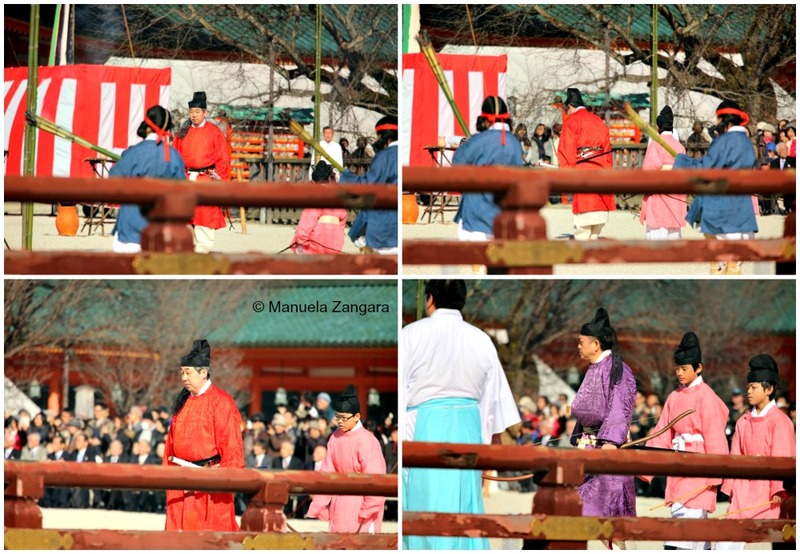 Priests read a Shinto prayer to conclude the Heian Shrine Setsubun-sai. 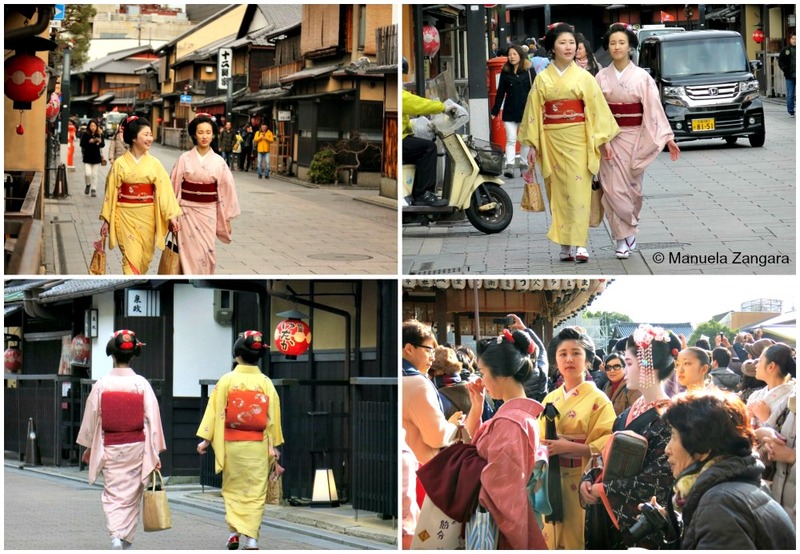 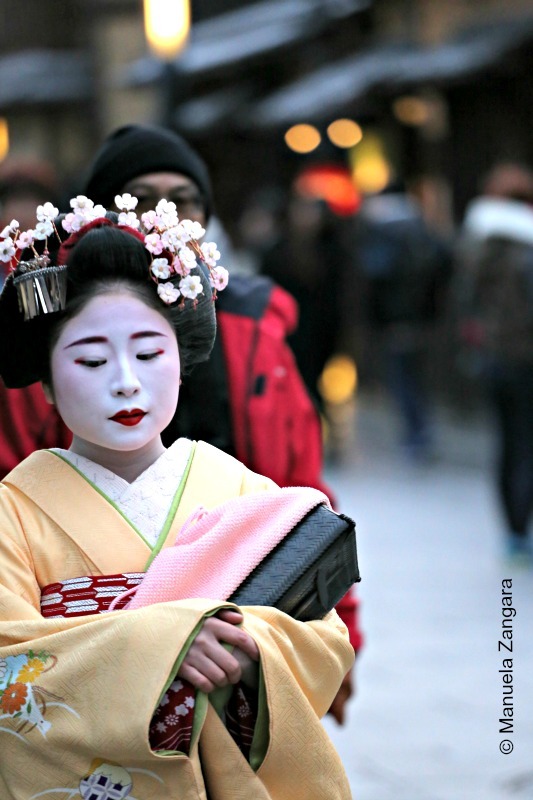 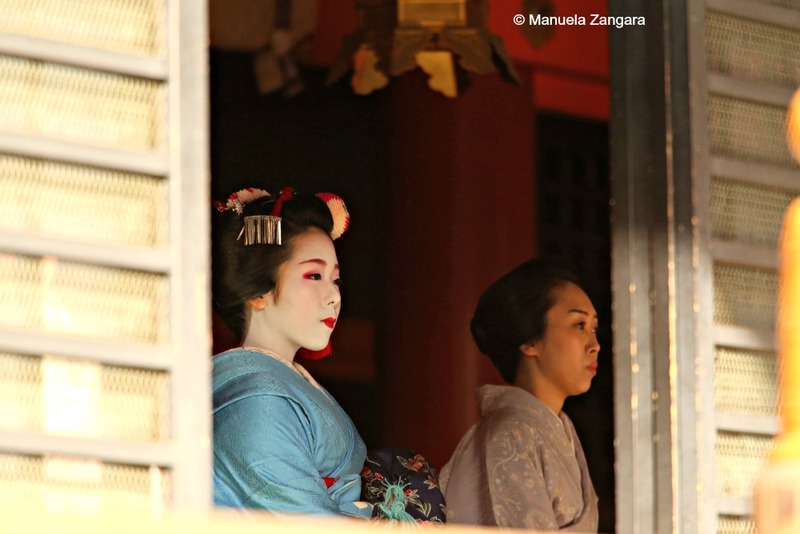 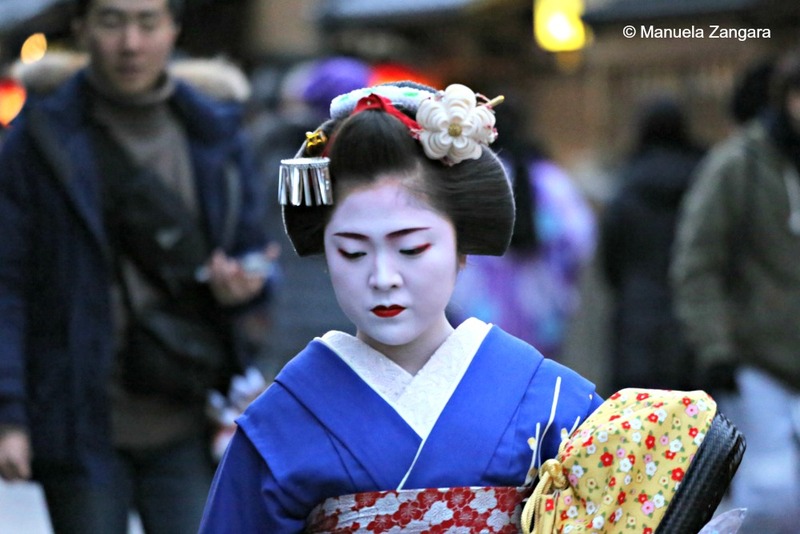 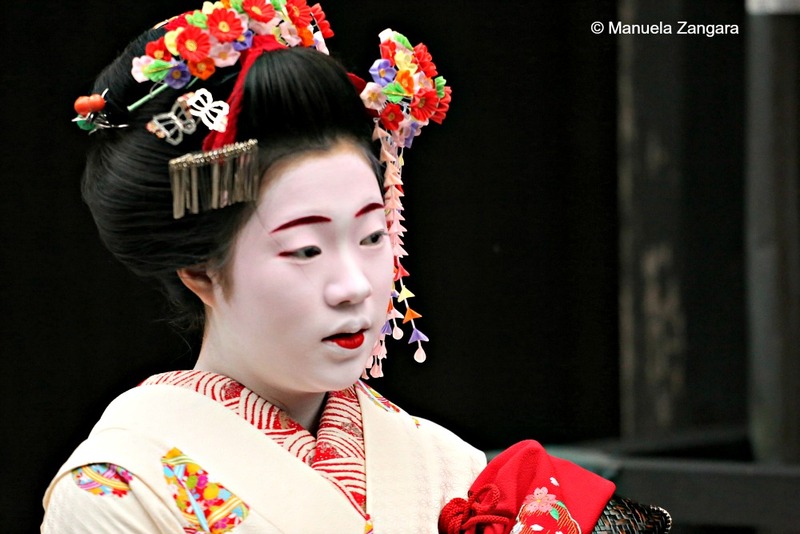 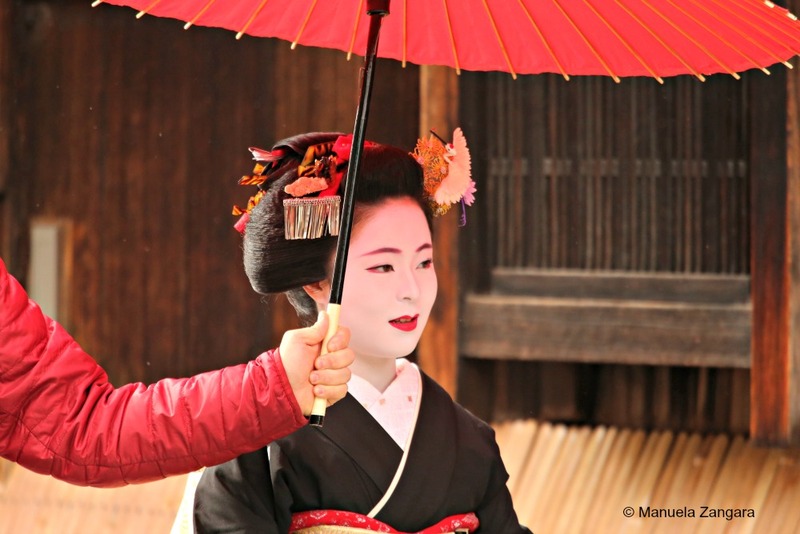 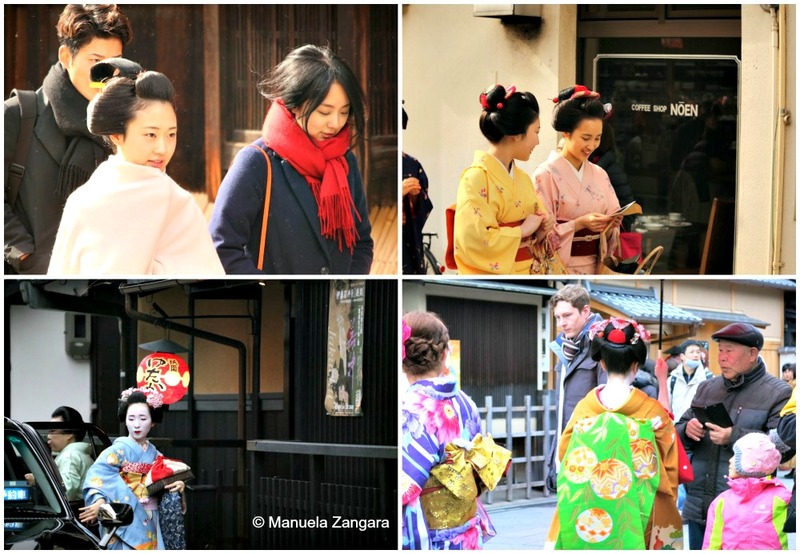 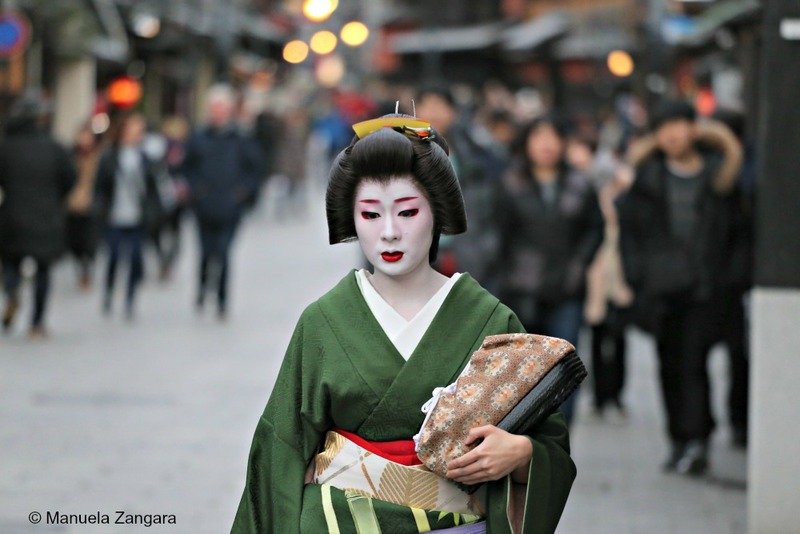 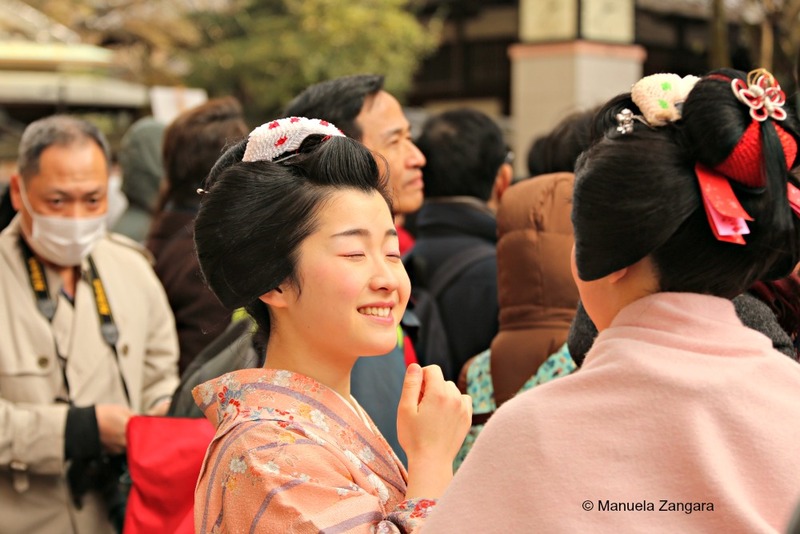 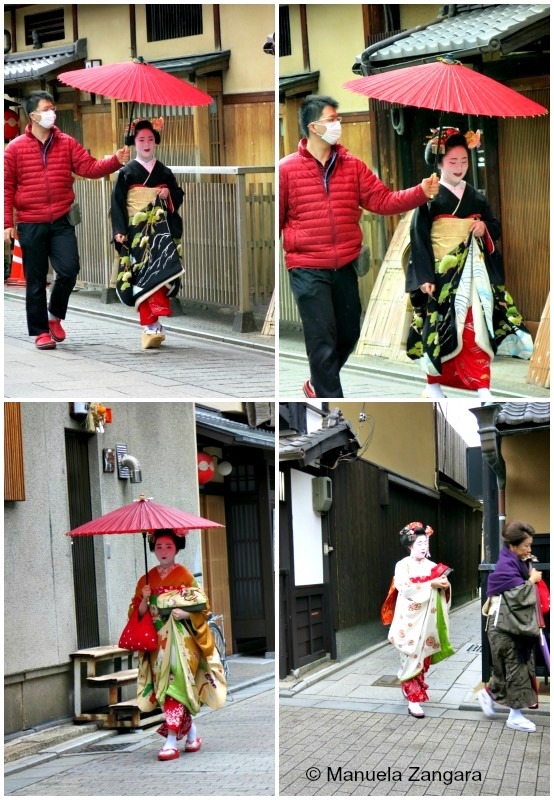 The best part about Setsubun in Kyoto is that it is much easier to see geisha and maiko around Gion! 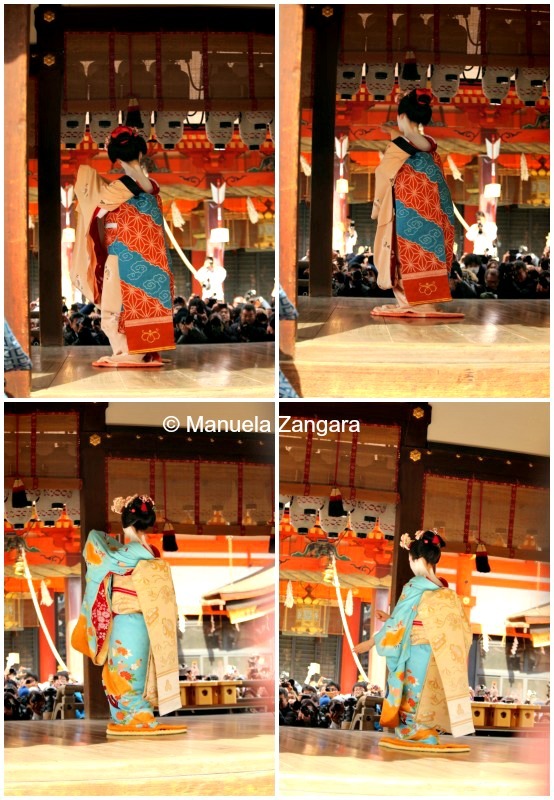 Look at the collection of photos we took! 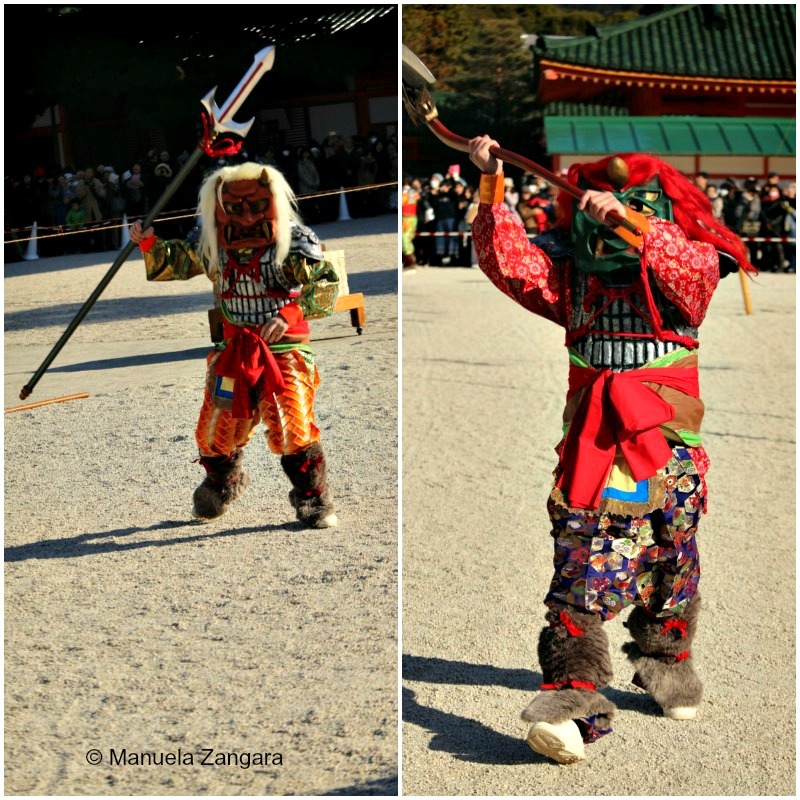 If you are in Japan in February, I highly suggest you attend one of the many Setsubun celebrations around!